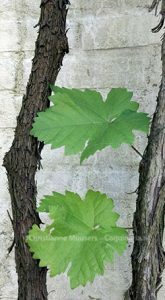 Grape vines do not just yield grapes. During the summer the leaves can be picked and pickled or used straight away. The best-known use of vine leaves is the Greek dolma, where they are used to wrap around rice. However, in this eighteenth-century recipe the vine leaves themselves are the main ingredient. 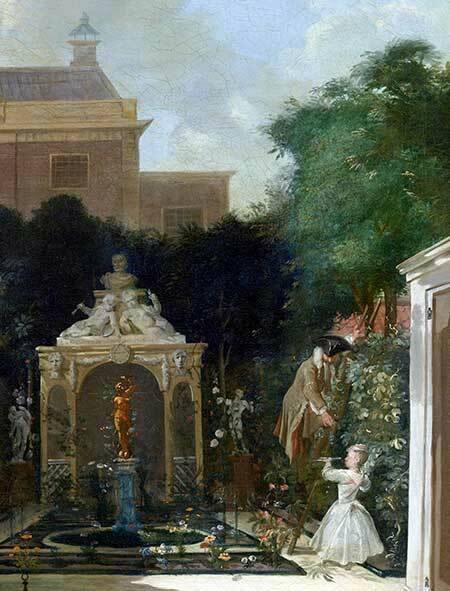 Just in case people are wondering whether grape vines grew in the Netherlands: in the picture, a man on a ladder is picking grapes and presenting them to a little girl (Amsterdam City Garden, Cornelis Troost, between 1740 and 1745). Dip any small-sized ingredient in batter, deep-fry it and voilà: a fritter or beignet. The word beignet is French in origin, and seems to be related to bigne, that means a hump or lump which appears after a whack on the head. The oldest mention is from the beginning of the twelfth century, and there are many medieval recipes for fritters, for example with apples. 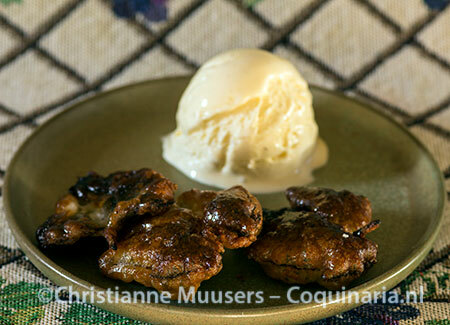 Apple fritters are still popular; in the Netherlands they are traditionally eaten with ‘oliebollen’ on New Year’s Eve. Other examples include fritters with salsify (Escoffier), and with other leaves (like sage) and flowers like elderberry blossom and zucchini flowers. Frying food that was dipped in batter is an even older practice, but back then they were not yet called beignets. The recipe for vine leaf fritters is from Le cuisinier moderne (1735) from the French cook Vincent la Chapelle. He was in the service of Stadtholder (Dutch chief magistrate) Willem Friso. I have written more about La Chapelle and his cookery book in the introduction to the recipe for Kale with chestnuts. According to the menus he provides, fritters – savoury ones as well as sweet ones – were served during the second course of the meal in the first half of the eighteenth century. This means that they were to be eaten at the same time as dishes with meat and fish, salads and tarts, and not during le fruit as the final course of the meal was called. La Chapelle has several recipes for fritters: with artichokes, purslane, elderflowers, apricots, and of course with apples. La Chapelle’s medium of choice for deep-frying the fritters is lard or clarified butter. Lard is rendered pork fat, while clarified butter is butter from which the milk solids have been removed so it can be heated to higher temperatures than fresh butter without burning. Lard and clarified butter will solidify when cold, just like suet. So, fritters that are fried in these fats must be eaten hot, otherwise the fat congeals, resulting in an unappetizing dish. However, it is perfectly alright to use good vegetable oil when preparing these fritters today. On the recipe page for Kale I have also written about plagiarism by La Chapelle. He copied many recipes from Le cuisinier royal et bourgeois from Massialot, including some recipes for fritters. But the recipe on this page for vine leaves is not taken from Massialot’s cookbook. Vincent la Chapelle has published several versions of his cookbook, the first editions were all printed in the Netherlands. The very first version of his cookbook, published in 1733, was written in English. Here, the recipe is called fritters with vine-leaves. Below is the text from the French version from 1735, dedicated to “son altesse serenissime, monseigneur le prince d’Orange & de Nassau, &c”. The English recipe text is taken litterally from the 1733 edition. Prenez de petites feüilles de Vigne, les plus tendres que vous pouvez trouver; ôtez la grosse côte, & les mettez dans un plat, avec un peu d’eau-de-vie, du sucre, & du citron verds rapé. Ensuite, faites une petite pâte; prenez une bonne poignée de farine, mettez-là dans une casserole, & la détrempez avec du vin blanc, ou de la bière. Mettez-y après celà, vos feüilles de Vigne, & les faites frire sur le champ; mettez les une à une dans vôtre friture, en prenant gardequ’elles ne sáttachent l’une à l’autre; observez qu’elles ayent une belle couleur; étant frites, tirez-les, poudrez-les de sucre, & les glacez avec la pêle rouge; dressez-les dans leur plat, & servez chaudement pour Entremèts. Take the smallest Vine-leaves you can get, take off the great Stalk, put them in a Dish with some French Brandy, green Lemon rasp’d, and Sugar. Put in a Stew-pan a good handful of fine Flower, mixt with some White Wine or Beer. Then put in your Vine-leaves, and fry them immediately, place one after another in the Hogs-lard; see they do not stick together. Let them be pretty well colour’d when fry’d, and strewed with Sugar, and glaz’d with a red-hot Fire-shovel; serve them up hot for a dainty Dish. La Chapelle tells us to remove the stalk and thick vein of the leaves, but I leave them on. They are still soft in young leaves, and I like seeing a little stalk on the fried leaf. Side dish for 4 persons; preparation in advance 15 minutes + 2 hours marinating; preparation 15 minutes. Choose tender vine leaves without blemish from a vine that has not been treated with pesticides, which will likely be from your own garden. Leave the stalk attached to the leaf. 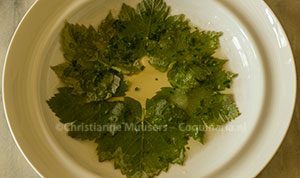 Carefully wipe the vine leaves with kitchen paper and put them in a deep plate. 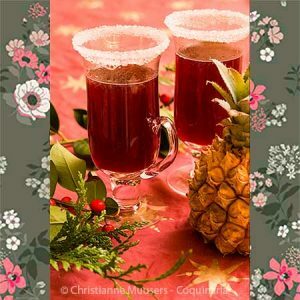 Temper cognac with sugar and lime peel and moisten the leaves with this mixture. Cover and let stand for two hours. This will tenderize the leaves. Put flour, wine salt in a bowl and beat to a smooth batter. Leave for 1 hour at room temperature. Deep-frying – Heat a layer of about 5 centimetres (2 inches) in a simple pan to 180 °C / 355 °F. Pat the vine leaves dry and coat them with the batter one by one by dipping them. Lower the vine leaves into the oil and fry until golden brown. Take them out and lay them on paper towels. Caramelizing – Preheat the grill of an electric oven. Arrange the fritters next to each other on a baking tray and sprinkle with powdered sugar. Place the tray high in the oven until the sugar has melted and starts to darken. The caramelized sugar will glaze the fritters. 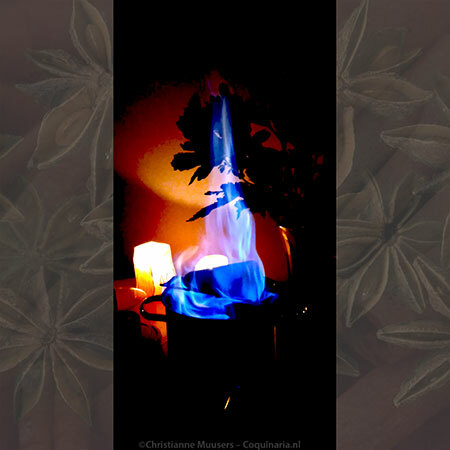 It is also possible to use a kitchen-blowtorch. Serve the fritters as soon as they are ready. A scoop of vanilla ice cream may not be historically correct, but it serves as a beautiful contrast in taste, texture and temperature. During the eighteenth century, these fritters were served as a side dish or garnish to accompany larger dishes with meat. François Massialot, Le cuisinier royal et bourgeois (1691, 1 volume). Facsimile editions of Le nouveau cuisinier royal et bourgeois in 3 vols from 1748. Vincent La Chapelle, Le cuisinier moderne . Online version of the edition in 5 vols from 1742. Facsimile editions of Le cuisinier moderne in 4 vols from 1735. Fritters are small, deep-fried snacks or side dishes that were already popular in the Middle Ages. This 18th-century recipe is from the French cook Vincent La Chapelle.